No kneading. No rolling. No biscuit cutters required. The perfect marriage of the classic sweet and salty combination. 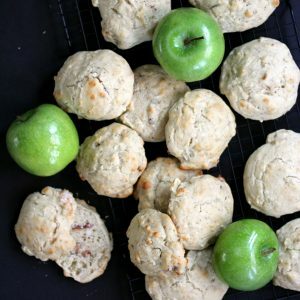 Studded with applewood smoked bacon and granny smith apples with a touch of maple, there’s no denying that these easy Apple Maple Bacon Drop Biscuits were meant to be a standout! Seriously, it’ll take longer for your oven to preheat than for you to mix the dough and get it on a baking sheet. Told you it was easy! This biscuit is the perfect marriage of the classic sweet and salty combination. 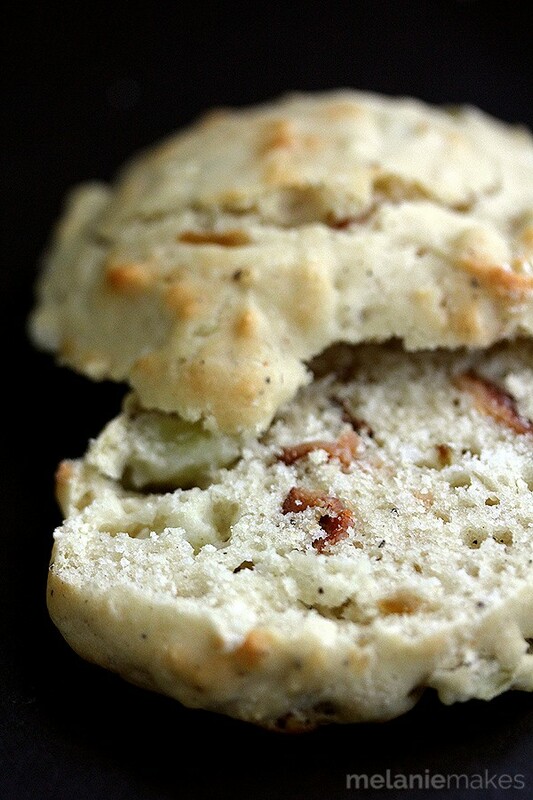 A biscuit studded with applewood smoked bacon and granny smith apples with a touch of maple. There was no denying that this recipe was meant to be a standout! I have visions of everything this workhouse of a biscuit could be. Think of it as an awesome Thanksgiving carb option. (Because really, you need to have several!) Or the day after Thanksgiving as a base for a Turkey sandwich. And what I’m actually planning next, the beginnings of the best breakfast sandwich ever. In fact, my husband is dreaming of this option, too. Just think of it… A bacon, egg and cheese breakfast sandwich that utilizes this biscuit as transportation to your mouth. Sign me up! And the easy part I mentioned earlier? There are actually two easy components which combine to form this couldn’t be easier recipe. First up is an amazing Harvest Apple & Maple Sauce from Robert Rothschild Farm. Sweet apples, maple syrup and savory spices all rolled into one. Even better? I did absolutely zero work to make it happen! Love this product as it’s all natural and gluten free for those that are on a restricted diet. The sauce is stirred into my Homemade Baking Mix and only four other ingredients. I told you it was quick! No kneading. No rolling. No biscuit cutters. You’re okay with all of that, right? Thought so! In a large bowl, stir together all ingredients until just combined. Using a large cookie scoop , drop batter on parchment or silicone mat lined baking sheet, being careful not to crowd. 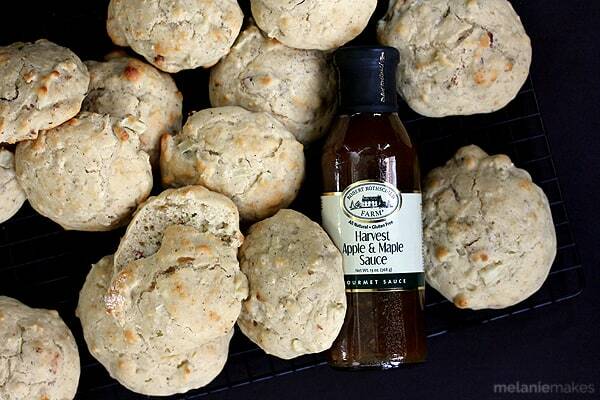 Slather your fresh from the oven biscuit with butter, or better yet, even more Harvest Apple & Maple Sauce for additional savory flavor. You simply can’t go wrong! These biscuits are the bomb dot com!! ;) I love the sweet and salty combo! Yum! I'll take a dozen! These sound fabulous! These would make an amazing breakfast sandwich! The sweet apple-salty bacon combo sounds fantastic! Thanks, Kristine - these biscuits are definitely versatile! 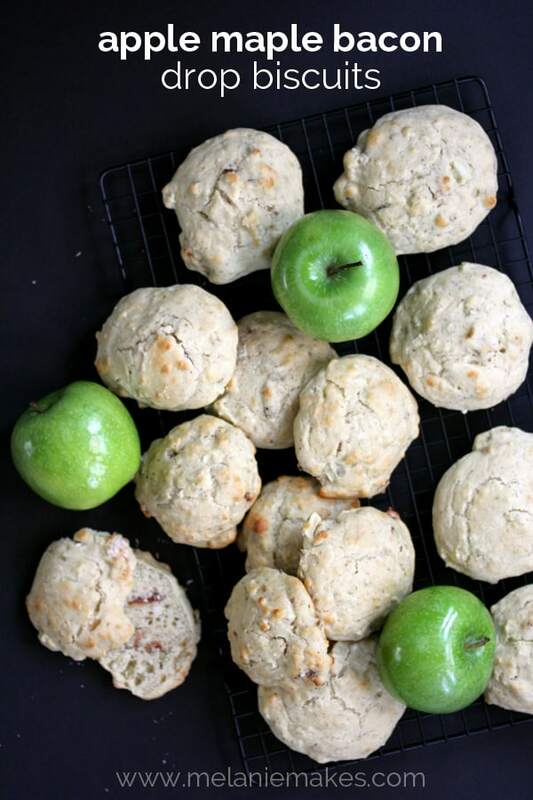 I love that flavour combination - apple, bacon and maple in a biscuit sounds absolutely perfect! 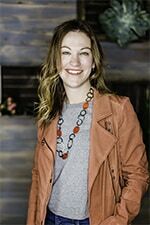 How perfect are these for fall!! I love salty bacon in biscuits or scones. These would be amazing as a Thanksgiving leftovers sandwich, too. Ok, you said 3 things i love: bacon, granny smith and maple! These biscuit are all that! And I love this -->No kneading. No rolling. No biscuit cutters required. YES! Pinned! Thanks so much, Kristi - let me know what you think if you give them a try! I can't take my eyes off of those gorgeous biscuits. Love the sweet/salty combo. Nom! You're so kind - thanks, Jennie! I agree, Jen - best carb ever! Melanie, what a great flavor combo! I love that these are super easy. Right up my alley for sure! Thanks, Sara! These biscuits are definitely beyond easy and ready in just minutes! 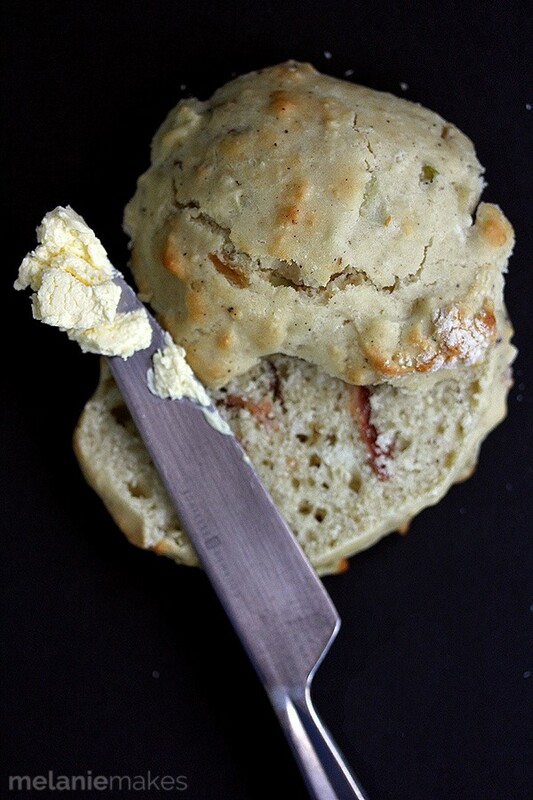 I am a huge fan of biscuits, I love the bacon and apple here. They have to be so good! They're definitely a crowd pleaser, Erin! I'm crazy about drop biscuits, and adding bacon makes them 1000x better. Bacon + easy = winner! Oooh, I need a bottle of that sauce! These biscuits look amazing! Yes you do, Amanda - thank you! The easiness of this biscuits is going to be dangerous - I could eat like 10 of them! They look so fluffy and delicious, and I love the flavors you used. YUM! I am usually an epic fail when it comes to baking, but I think I could handle these! They look and sound amazing so I am going to have to give them a try! You've totally got these, Becky! Let me know if you give them a try!